The choir, Franklin’s family, preachers and remaining guests swayed as Wonder played the classic tune in honor of his old friend. “The reason we are here today is love,” Wonder said in remarks. Before Wonder performed, Gladys Knight sang “You’ll Never Walk Alone” and “Bridge Over Troubled Water.” As Franklin’s coffin left the church, Jennifer Holliday sang “Climbing Higher Mountains.” Others who performed over the eight-hour ceremony included Faith Hill, Fantasia Barrino, Jennifer Hudson, Ariana Grande and Chaka Khan. Thomas recalled how, as a young man, Franklin’s music soothed his mother when the family faced challenges, and later smiled when the soul icon would attend his Detroit Pistons games and sit near his mom. Record giant Clive Davis remembered Aretha Franklin as a woman with a thirst for knowledge, as a “true Renaissance woman” — and one with a streak of perfectionism. Davis, who oversaw Franklin’s music for decades, including such later hits as “Who’s Zoomin’ Who?” and “I Knew You Were Waiting (For Me),” said once Franklin committed to a project, she’d go into “Aretha mode,” privately rehearsing and preparing so intensely that it was rare for her to need more than a few takes in the studio. Jackson, who has Parkinson’s disease and is in his late 70s, spoke slowly as he stood in front of the gathered mourners at Greater Grace Temple in Detroit on Friday. He led them in a prayer of thanks for Aretha and her minister father, asking that God make all in the church “better, not bitter,” by the time the day is over. Bill Clinton memorialized Aretha Franklin as a woman with “breathtaking talent” who kept on charming audiences despite her illness. The former president recalled being an “Aretha groupie” all his life and being thrilled to meet her backstage at her last public performance, a benefit in Harlem for Elton John’s AIDS charity last year. She was “gaunt” but went on to perform for 45 minutes. “I’m doing better now,” Clinton replied. Clinton said, “I wonder what my friend has got on today. I wanted to see what the girl was carrying out,” to a wave of laughs and claps from the crowd. Franklin was wearing a gold gown, her fourth outfit of the week. Aretha Franklin’s family members have paid tribute to a woman who cooked for them, gossiped with them and passed on her gifts to them. Victorie Franklin, a granddaughter, said at the Queen of Soul’s funeral that she will always cherish being part of Franklin’s legacy, recognizing parts of her grandmother in her. Aretha’s son, Edward, sang “Mercy Mercy Me (The Ecology)” by Marvin Gaye. Former Presidents Barack Obama and George W. Bush didn’t attend Aretha Franklin’s funeral but they sent messages to honor the Queen of Soul. Bishop Charles H. Ellis said after the song that he felt old because when he saw “Ariana Grande on the program, I thought it was a new something at Taco Bell,” but said he now owed her some respect. Faith Hill honored Aretha Franklin by singing “What a Friend We Have in Jesus” during the Queen of Soul’s funeral. Hill’s performance got Bill Clinton, the Rev. Jess Jackson and the Rev. Al Sharpton up on their feet. Many in the audience of the Greater Grace Temple in Detroit also stood as Hill belted out the hymn. Detroit Mayor Mike Duggan also took to the podium to announce a proposal to rename the city’s waterfront Chene Park after Franklin. Aretha Franklin’s body has been covered in shimmering fabric and her casket has been closed, with shouts of, “Hallelujah!” coming from the audience. 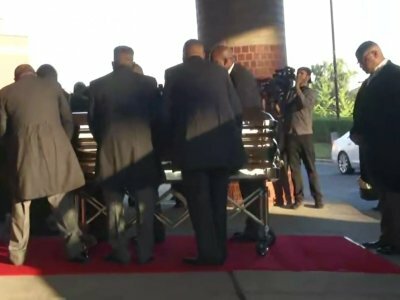 Family members surrounded the Queen of Soul’s gold casket as it closed on Friday morning, marking the formal start of her funeral. The Rev. Jesse Jackson comforted actress Cicely Tyson and Franklin’s family members comforted one another. The church’s choir sang “Walk in the Light” as Ellis encouraged the congregation to sing along. Ellis said, “It took a little time to get in here, but I believe the queen wouldn’t have had it any other way.” He said everyone present would get a program, and joked they were likely to be available soon on eBay. The Queen of Soul Aretha Franklin has been honored at London’s Buckingham Palace on the day of her funeral in Detroit. The official residence of Queen Elizabeth II became an unlikely setting for a rendition of Franklin’s “Respect” played by the Welsh Guards Band during the popular Changing of the Guard ceremony Friday. The Queen of Soul’s funeral is underway. A processional of Aretha Franklin’s family and other loved ones is filling the aisles of the Greater Grace Temple on Friday morning in her hometown of Detroit. They filed past and paid their respects at Franklin’s open casket, where they saw her wearing a sparkling full-length gold dress with sequined heels — her fourth and final outfit of the week. Many in the pews ignored repeated calls of no phones permitted to take selfies with former President Bill Clinton and Hillary Rodham Clinton as they filed in. The singer, who is scheduled to perform at the ceremony, and the “Saturday Night Live” cast member entered Detroit’s Greater Grace Temple smiling on Friday and posed for photos. They even shared a brief kiss on the stage. The start of the service — intended to begin at 10 a.m. — was delayed. Franklin’s white hearse arrived more than two hours before the service was scheduled to start. In the moments before Aretha Franklin’s funeral, dignitaries filled Detroit’s Greater Grace Temple. Franklin’s white hearse arrived more than two hours before the service was scheduled to start. Aretha Franklin’s body has arrived at a Detroit church where her funeral is being held Friday. Franklin’s white hearse arrived more than two hours before the service is scheduled to start at 10 a.m. Eastern. Among those honoring Franklin Friday are about two dozen owners of Pink Cadillacs who arrived at the church early Friday. The tribute is a nod to Franklin’s funky ’80s tune, “Freeway of Love,” which prominently featured the car in the lyrics and video. Organizers of Aretha Franklin’s funeral insist it will be a spirit-filled service, not a show. Yet there’s no denying the star-power attending the Queen of Soul’s final send-off. The speakers at Friday’s invitation-only funeral at Detroit’s Greater Grace Temple include former President Bill Clinton, the Rev. Jesse Jackson and Smokey Robinson. Singers include Steve Wonder, Ariana Grande, Jennifer Hudson, Faith Hill and Chaka Khan.